This is Bernie. 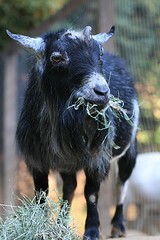 He is a pygmy goat, a recently neutered pygmy goat. This means he has the unappealing scent of an intact goat. Their musk is apparently attractive to does, which I find wrong. Who am I to judge? Anyway, Bernie is an older dude with a sweet personality. He is at the Center for Animal Protection and Education (CAPE) in Santa Cruz which primarily does dog rescue but also has a small sanctuary.